Plenty of thought goes into airport design these days—it’s an opportunity to market a region and appeal to passengers at the same time. Often these attempts come off as a little forced, if not downright contrived. Not so at Burlington International Airport, Northern New England’s gateway to points across the Northeast and Canada. Like Vermont itself, BTV effuses a warm Green Mountain aesthetic and a country store ambience sourced by local vendors sharing regional products. The terminal is even constructed from local marble, granite, and maple that, along with white Adirondack rocking chairs, greet us or send us on our way with a taste of Vermont. Regional airports continue to grow in importance across North America. Travelers appreciate their convenience and familiarity, and a much more relaxed, though no less safe, environment that removes much of the stress from air travel. With direct flights to New York City, Atlanta, Chicago, Orlando and other major hubs, BTV couldn’t be more convenient. Located less than two hours from Montréal, the airport also provides access to the United States and the world for Quebecois. The BTV website even features a “Bienvenue Canadiens” section in French, as well as bilingual signage. Vermont holds a special place in most visitors’ minds, a laid-back environment populated by a diverse population that includes urban creatives and farmers, academics, and natural resource workers. Most of us equate the Green Mountain State with intimacy and good intentions, where the common good remains a shared goal of its denizens. One picks up on this casual yet thoughtful air the moment of arrival at Burlington International Airport, from the broad floor-to-ceiling picture windows to the Art Exhibit space where local paintings adorn the walls. There is a yoga room where travelers can practice in a serene and uninterrupted environment. A private nursing area adds more relaxation to the mix. In partnership with the local library, BTV provides a free “take a book, leave a book” exchange that reflects local priorities and sets the Burlington airport apart from most others. The gift shop features numerous “Only in Vermont” souvenirs and keepsakes to remember or start your visit. In many ways, the local touches at BTV exemplify all that is great about the regional airport boom. Skinny Pancake offers a window into the Vermont culinary scene. Considered among the most locally sourced airport eateries in America, Skinny Pancake and its panache for making crepes are legendary from Stowe Mountain Resort to the Burlington Waterfront. The creperie offers three eateries within the airport: One restaurant in each terminal, and another with a smaller menu by the ticket counters. Using cage-free eggs, Cabot cheddar, and, of course, Vermont maple syrup, you can choose crepes with basil sunflower seed pesto, local blueberries, or native potatoes, among other provender. Not a crepe enthusiast? The English muffins and biscuits are also housemade. You can even place your order online before heading to the airport. Of course, in the end, airport visits are all about ease of travel. 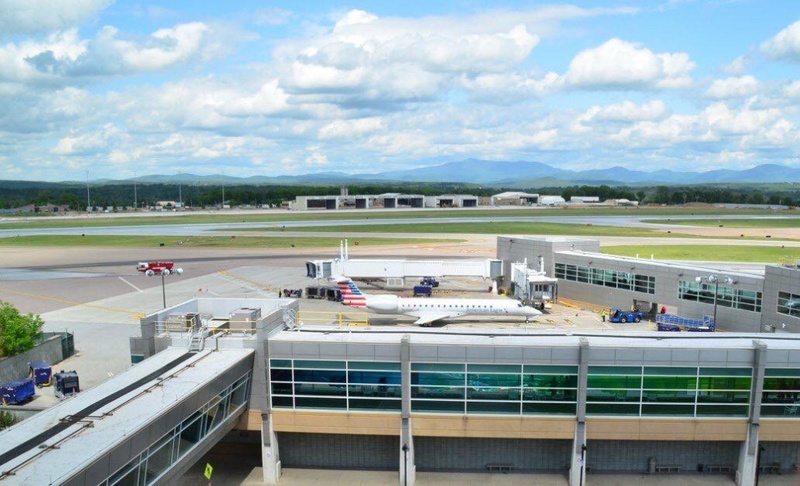 Fortunately, making one’s way to to BTV’s 15 gates is extremely unencumbered, as the airport rarely feels busy—a testament to the $45M 2011 renovation that expanded the physical space and reduced lines and waiting times. The terminal features covered, secure parking that is a short indoor walk from the terminals. Even with free luggage carts for use. Flying to or from a regional airport takes the hustle and subsequent stress out of air travel. From BTV, we can connect to every major travel hub in the East, yet our experience feels more akin to a stroll in the Green Mountains or along the Lake Champlain waterfront than a push-me, pull-you struggle to get from Point A to Point B. Ease through the TSA line, settle into the Skinny Pancake, and relax. After all, you’re still in Vermont.